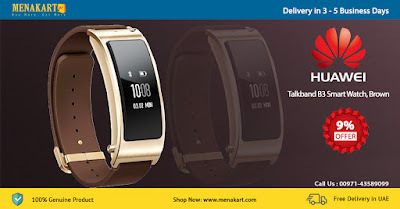 HUAWEI's TalkBand B3 is the next generation of wearable devices. The state-of-the-art design keeps you connected in style—any time, any place. HUAWEI TalkBand B3’s innovative Capsensor intelligently identifies whether the device is on your wrist or not, ensuring your sleep patterns are accurately captured. Keep better track of your wellness. HUAWEI TalkBand B3’s bluetooth headset has a tight, comfortable fit that can be worn effortlessly for hours. HUAWEI TalkBand B3’s high-grade CSR chip and pioneering noise-reduction algorithm provides crystal clear, high-quality sound. The dual-microphone design and optimised antenna means effortless, hands-free calling even in the difficult and noisy environments. Your most important contacts, available at your fingertips. HUAWEI TalkBand B3 stores your closest contacts directly in the HUAWEI TalkBand B3’s speed-dial phonebook. You can easily adjust or change your top contacts from your smartphone. HUAWEI TalkBand B3 keeps you connected with the world around you by providing accurate weather information. As the day changes, you change with it. Be better prepared for what comes next. If your smartphone goes missing, HUAWEI TalkBand B3 helps you find it. Simply tap the display, click on the HUAWEI TalkBand B3’s phone icon, and your smartphone will begin ringing. Mute / Reject incoming calls. Power on or off the Gemini. Answer, reject, or end incoming calls. Dial the number you last called.